Welcome to our series "Feathered Friend Friday." 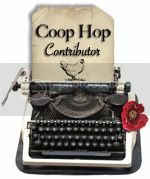 Every Friday I write a post with interesting facts, photos, or funny stories about our chickens and guineas. If you need to catch up, you'll find all the Feathered Friend Friday posts here. Molting season has begun. I found a big pile of fluffy feathers under Buttercup's spot on the roost a few weeks back, so I knew she had begun to molt. She is still losing feathers, but I think she's winding down because now some of her wing feathers are falling out. Her tail feathers will be next, then her body will be in full feather production mode. I have lots of feathers that I've collected over the years and I've always wanted to display them somehow. I decided this year to do just that with one of Buttercup's small feathers. I bought a picture frame with a mat and wrote "Buttercup 2012" in freehand on the mat. I wanted to use a fine point sharpie, but we only had the wide tip version so that's what I ended up using. I had a piece of gray felt left over in my craft bin, so I used that as the background for the feather. I really like how it turned out and may frame some more like this in the future. Until then, I'm on the lookout for other creative ways to display my feather collection. Any ideas, fellow feather collectors? This post also featured on Stacked Stone Farm. That's why she's my favorite grand chicky. Haha :) She is beautiful. I love how that looks! Great idea. Oh what a great idea! I love it! I could totally see several of those with different feathers arranged on a wall nicely together. 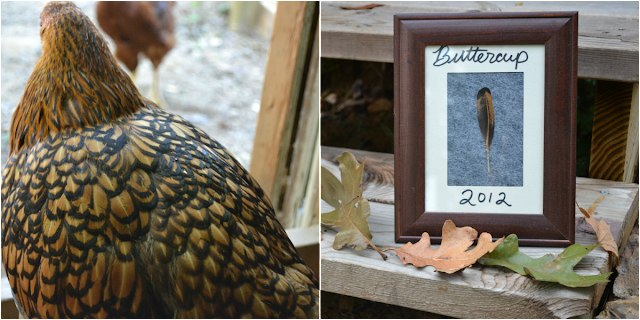 What a great keepsake to have for each of your hens :). I hope you don't mind me sharing this idea. I'm going to tweet this to my followers. What a fun idea! We just got chickens this year and I'm always picking up good feathers. I figure one I get a show box full, my daughter and I can find some good crafts to use them for. Thanks! I'm always picking up feathers out here so I'm trying to use them in a creative way. I have piles of them in my dresser drawer just waiting to be used. Thanks for sharing at our blog fest! Nice post. I enjoy your blog. It was my pleasure! Thanks for your kind words :) I'm so happy you enjoy the blog! This is a terrific idea Tammy! I've got a few chicken feathers tucked into birds nests and wooden bowls, but I really like the idea of framing them. I hope you'll join us again.. and feel free to link back to my blog or place our button in your post along with the other great hops you visit! Hi Deborah! Just put your button in this post. I was happy to contribute to your blog hop! Yes, GLWs have gorgeous feathers! Buttercup is a beauty and so are your girls! PS. We've got two Golden Laced Wyandottes and sure have pretty feathers don't they? What a creative use of the season's molting! Thank you for linking up at the Clever Chicks Blog Hop, hope to see you back again next week with another clever post! Cool idea Tammi! This would be great for decorating a wall and especially nice as memorials for chickens that have passed! Thanks for sharing!